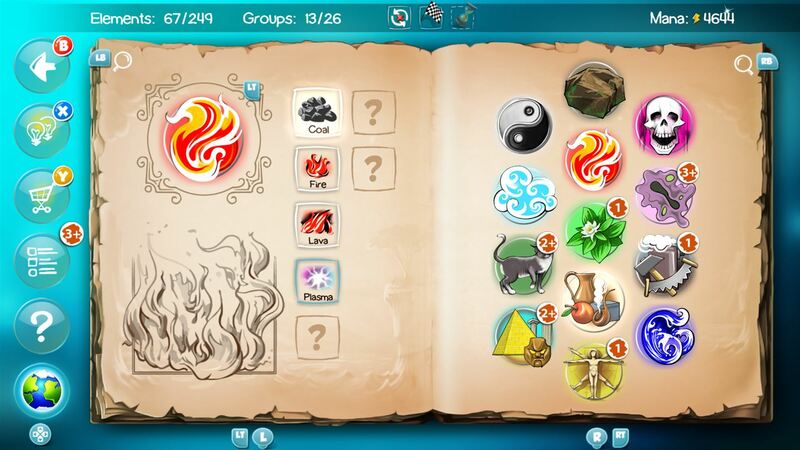 The idea behind Doodle God of combining elements such as fire and water to create new elements until it all snowballs and you’re eventually making crazy stuff like Absinthe and rock-n-roll is a pretty brilliant one as evidenced by its longevity as a browser and mobile game. Is the execution of that concept interesting enough to justify paying real money for it on Xbox One instead of playing it (or a copycat clone) for free on your browser, though? Find out all of the details here in our Doodle God: Ultimate Edition review for Xbox One. As mentioned above, the idea behind Doodle God is to combine basic elements – earth, fire, air, water – into brand new elements, items, and even concepts. For example, earth + fire = lava, or air + lava = stone. Eventually you get to more interesting things like energy + swamp = life, earth + egg = dinosaur, air + dinosaur = dragon, or crazy stuff like quicksilver + demigod = philosopher’s stone or book + human = knowledge. In the main mode your ultimate goal is to unlock all 249 of the combinations in the game but there is also a Quest Mode that tasks you with creating specific items based around a theme such as a “Save the Princess” quest that has you creating warriors, spellbooks, and secret doors among other things. If you actually play legit and don’t look up help or use the game’s hint system, Doodle God: Ultimate Edition can actually provide a good 5-10+ hours of content, which is pretty decent for $10. The elephant in the room, of course, is the fact that the game is also available elsewhere for either free or very cheap, so paying money to play it on your Xbox One is a bit of a tough sell. Like most mobile games that come to consoles the benefit of paying to play on Xbox is that it mostly gets rid of the intrusive free-to-play hooks and lets you play without nagging you constantly. That isn’t to say the game doesn’t have microtransactions or that those free-to-play mechanics are absent entirely, however, as you can still pay real money to unlock more hints and help items, but they are easy enough to ignore. The actual gameplay in Doodle God: Ultimate Edition is pretty straightforward. You select items with the left and right triggers and analog sticks and then press the “A” button to try to combine them. If they can combine, you get an animation showing the new item. If they can’t combine, nothing happens. It isn’t quite as simple and elegant as just tapping the various elements like you can on a smart phone, but it is a fairly smart system that works with a controller quite well. At some point, however, we have to get down to the core question of whether Doodle God: Ultimate Edition is actually any fun to sit down and play and the answer to that is only a very tepid “sort of”. The reason why Doodle God works on browsers or mobile devices is because it is great for short bursts of play for a few minutes at a time. Playing for any longer than that, like most console players will want to, reveals a fairly repetitive and boring experience. There just isn’t a lot of variety here. I’m also not a fan of how esoteric and unintuitive a lot of the combinations can be. Even combinations of things that really exist in real life don’t always work here, which can be frustrating. Occasionally the game can get pretty clever, such as making Apple + Cellphone = Religion, but all of the tongue-in-cheek cleverness just make the game even more frustrating. You never know when the game is going to be literal or when it is going to be cheeky in the items it wants you to combine. I can only assume it was designed like this intentionally to try to get you to spend money on hint items. The game can definitely be satisfying when you think up something smart and it actually works, but that doesn’t happen nearly often enough and instead the combinations seem more random and nonsensical. As far as the presentation goes, it is clear Doodle God: Ultimate Edition wasn’t exactly optimized for consoles as it slaps you in the face with a painfully obvious mobile game UI right away. 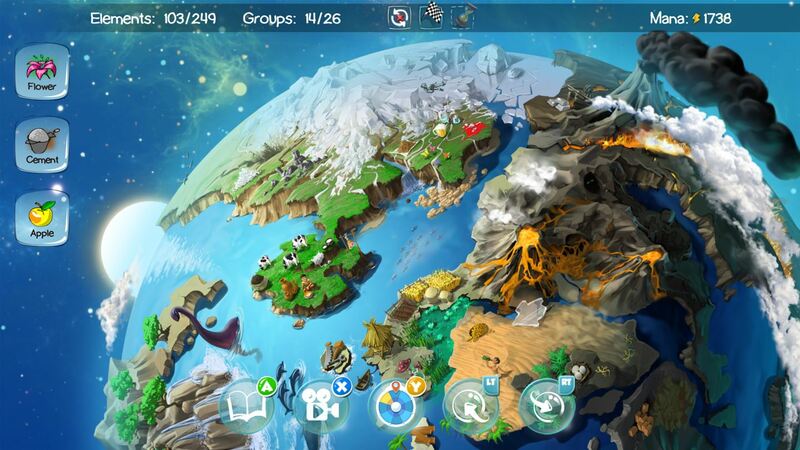 You spend most of your time looking at bland screens full of icons of the various elements and items you can combine, but the game also has a neat visual representation of what you’re doing in the form of a 3D globe that gradually fills in with all of the new stuff you’re creating. The globe doesn’t really serve any purpose, but it does look cool and is a fun way to track your progress. All in all, Doodle God: Ultimate Edition doesn’t really do enough to justify playing it on the Xbox One if you already have (most likely cheaper) access to it elsewhere. It just simply doesn’t work as well as a sit down experience as it does as a quick mindless distraction on your phone. I will also say that while I do love the core concept behind the Doodle God series, it can be a little too cheeky and clever for its own good sometimes. If it were more intuitive and realistic I might suggest it as a good educational game for kids, but I don’t think kids can learn much here considering it is so abstract and esoteric and not based on reality. 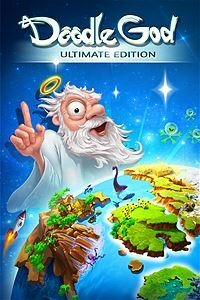 In the end, I can’t really recommend Doodle God: Ultimate Edition on Xbox One and suggest instead you play Doodle God on your mobile device as it works a lot better there.